Al Gurg’s previous experience includes twelve years at various senior positions within the consumer and corporate banking divisions in National Bank of Dubai (now Emirates NBD). 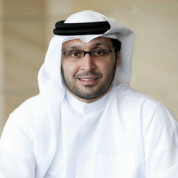 Tariq is a founding board member of the UAE Genetic Diseases Association (GDA), which is chaired by H.H. Sheikh Nahyan bin Mubarak Al Nahyan and was also a member of the National Anti-Money Laundering Committee of the UAE (NAMLC), which is chaired by the Governor of the UAE Central Bank. In addition to his extensive knowledge and experience, Tariq has also undergone two years of extensive training in leadership as part of the leadership program by H.H. Sheikh Mohammed Bin Rashid Al Maktoum. "The teacher is fundamental for children to receive quality education, and is the key mechanism on how information is disseminated throughout the classroom and to how a child learns, hence more emphasis should be placed on how to incentivize, develop and increase the number of teachers."